Pioneer SC-LX83 review | What Hi-Fi? How do you make a What Hi-Fi? Sound and Vision Award-winning receiver better without actually spending time and money tinkering with it? Make it more affordable, of course. 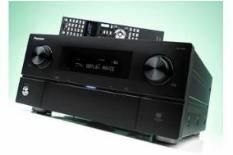 In the five months or so since we declared Pioneer’s SC-LX83 our favourite £1500+ receiver of 2010, the price has come down from £2000 to an even-more-tempting £1700. Less, even, if you really shop around. Making off with Awards isn’t all cakes and ale, of course – it also means you’re there to be shot at. Last year, the Pioneer didn’t have as much stiff competition to contend with. What this review confirms, though, is that the LX83 isn’t about to give up its crown without a fight. Spec-wise, it’s still on the money. Some close rivals have two extra channels of amplification, but a fearsome 190W for each of its seven powered channels is not to be sniffed at. And neither is THX Ultra 2 Plus certification, ethernet connectivity for internet radio and streaming of network-stored files and a moving-magnet phono stage. Six HDMI inputs and a couple of outputs (3D and ARC compatible all) should prove more than adequate, too, and the inclusion of adaptors that let the X83 be placed behind a door while still being responsive to the remote is a nice touch. The automatic set-up is thorough – one of the most accurate around. However, the on-screen menus are only so-so and the remote control is overburdened. These ergonomic question-marks, though, become irrelevant once the LX83 starts doing its thing. As far as multichannel movies go, that thing turns out to be delivering a vibrant, exciting and entirely controlled sound. The Dolby TrueHD soundtrack to How To Train Your Dragon enjoys effortless dynamic variation, deep and solid low-frequency impact, and a wide-open soundstage that simultaneously allows the fine details full expression and integrates each disparate thread into a neatly unified whole. Expansive, subtle and atmospheric, the Pioneer pulls off the by-no-means simple trick of combining the unquestionable authority of a nightclub doorman with the lightness of touch of a Jenga world champion. Tonal variance is excellent, the midrange is expressive and the top end gleams benignly. Switch to stereo music and the LX83 is as composed and sure-footed as ever. Portishead’s Machine Gun is an across-the-board workout for even the most accomplished amplifier, but the Pioneer sticks to its guns and serves up a fluent, detailed sound, aggressive without being bolshy and timed almost as impressively as the Arcam AVR-400 can manage. For now, the SC-LX83’s position is assured. It’s got the multichannel talent to see off a spirited challenge from Onkyo’s TX-NR3008 and the musical chops to go toe-to-toe with the Arcam. If you need one box to do it all with a fair degree of aplomb, don’t look any further.